Fremont County Group Homes provides at-risk youth a relaxing home environment, the opportunity to reunite with their families and become productive citizens. Welcome to Fremont County Group Homes, Inc.
Our two homes are located in rural areas of Fremont County, Wyoming in the shadows of the magnificent Wind River Mountains. We provide at-risk youth a relaxing home environment, the opportunity to reunite with their families and become productive members of the community. Safety and confidentiality are two critical components of our 24/7, 365-day care. Accountability is a requirement, not an option, in our Lander Group Home for Girls and our Riverton Group Home for Boys. All of our juveniles, ages 10 to 17 years, have daily chores and responsibilities, but they also have a chance to learn new skills like fishing, camping and wilderness exploration. We are able to accommodate 20 youth in our homes combined. Twelve are for long-term, court-ordered cases, six are for crisis placement and two are for runaway youth. 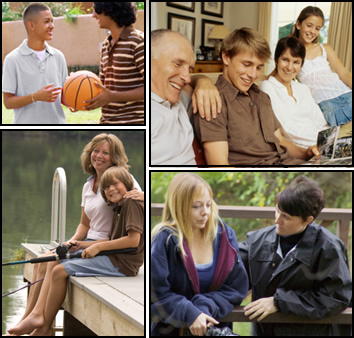 Our premise is that all youth and families have strength and resiliency, and we offer family mediation, visitation, individual and group counseling for all individuals in our programs. Please take a look; we think you will like what we are doing to help Fremont County's youth. Runaway and Homeless Youth are provided three free sessions of family mediation with a Licensed Social Worker.